The marble monuments are worthy of study. They are well designed and splendidly carved. They enable us to follow the Broughton family from Thomas the founder of the chapel. 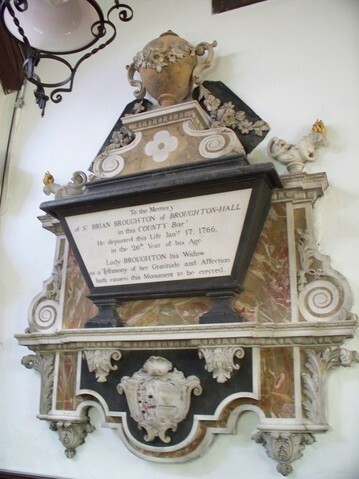 His monument, with its Latin inscription, tells us that he 'took to wife Frances Bagot, sister of Harvey Bagot baronet of Blithfield, by whom he had children Brian Broughton, knight and baronet, Peter, Elizabeth, Dorothy and Mary'. Brian Broughton married Bridget, daughter of Thomas Lucy of Charlecote in the county of Warwick, knight, by whom he had children, Thomas, Peter, Brian, Spencer, Harvey, Charles, Bridget and Lucy. The centre aisle is dominated by two large cartouches between the arches. 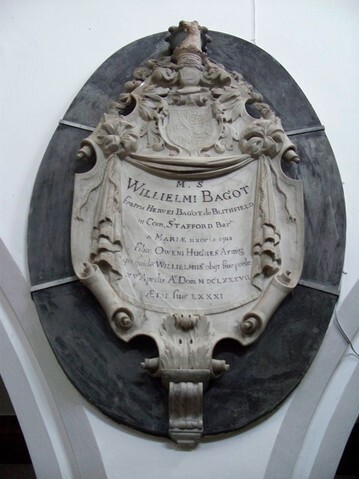 That on the north side is to the memory of William Bagot, who died in 1687. The mystery is why should a member of the Bagot family be commemorated in the Broughton Chapel? All we can discover is that William was brother of Harvey Bagot and of Frances, the wife of Thomas Broughton. It is possible that he died at Broughton and so lies buried here. 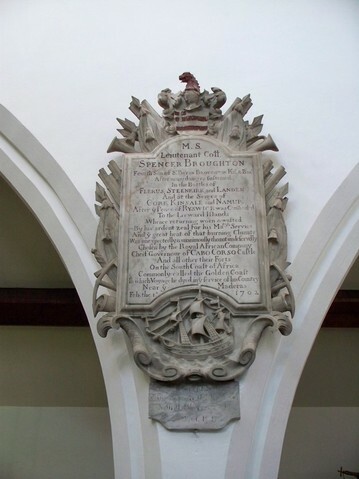 Directly opposite William Bagot's cartouche is a very fine memorial to Spencer Broughton, fourth son of the first baronet, who sought his fortune in the army and died while on Foreign Service in 1702. At the foot of the cartouche is a warship of the period. Three are inscriptions to four former chaplains, who lie buried under the centre aisle. Although these are covered by red carpet, they are worth reciting in full. The memorial commemorate William Ingram, John Podmore, Samuel Foden and Humphry Wright. Here lies the first whom Death translatedafter this church was consecrated. and Mr WILLIAM INGRAM called. He was - He is a Blessed man. Farewell my littel flock. I loved you well. The chancel walls are covered with memorials. The large one on the south wall, which blocks the window is to the memory of Sir Brian the third baronet and Elizabeth, nee Delves. 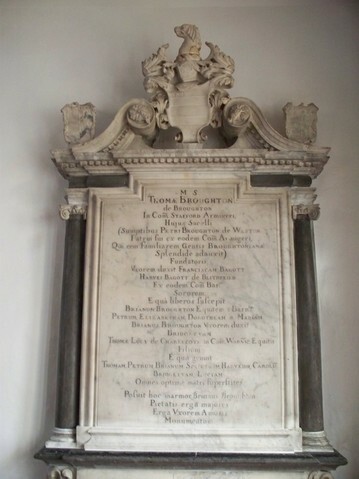 Most interesting is the memorial to the Reverend Thomas Broughton, sixth baronet, which not only lists his three wives but also his children and their marital partners. It continues to list Sir Thomas's virtues in the most extravagant language of the time. For example 'As a divine he was zealous and impressive. he was distinguished as an orator by forcible language and an abundant flow of eloquence ...' But it records that he built Doddington Hall 'without encumbering his estates with so much as a shilling'. There are also many small oval marbles well worth taking the time to inspect.